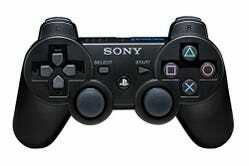 Click to viewThe Gadget: The DualShock 3, PlayStation 3's now de facto controller with both rumble and motion-sensing. It replaces the previous SIXAXIS controller without rumble, which is now discontinued. The Verdict: Fantastic. 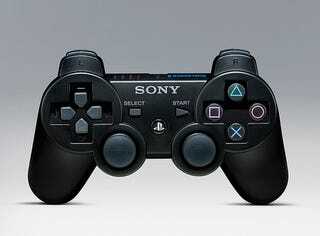 It's what the PlayStation 3 controller should have been at launch. You don't realize how much you're missing rumble until you actually get it back. We tested it with Folklore, Resistance, Super Stardust HD and Heavenly Sword and all of them behaved just like rumble should. It vibrated when you blew up ships in Stardust, when you shot and got shot in Resistance, and when you whipped out your little demons in Folklore. We didn't have the time to play through the entire game(s) to see if there are tons of different varying levels of intensity—say, if some cut scene started with a gentle vibration that ramped up to something crazy—but we've been hearing online that it does. The DualShock 3 is also heavier than the SIXAXIS—still slightly lighter than an Xbox 360 controller—but definitely heavier. It feels right, not like the feeling you got from the SIXAXIS that someone hollowed out your controller while you weren't looking.